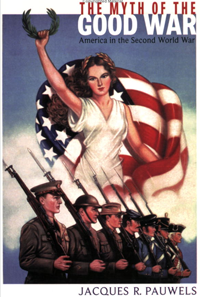 Was the role of the United States in the Second World War an essentially idealistic one, a crusading struggle to conquer the dark forces of German fascism and Japanese militarism? Was it an unequivocally « good » war? Historian Jacques Pauwels questions this orthodox view of America’s participation in World War Two. In his view, the United States was not the disinterested champion of democracy in the face of dictatorship: its role in the war was determined, rather, by the interests of its corporations and of its social, economic and political elites. His analysis explicitly addresses many of the myths that have since been fostered about the U.S. decision to enter the war alongside the Soviet Union, the U.K. and Canada, and against Nazi Germany. The Myth of the Good War offers a fresh and provocative look at the role of the USA in World War Two. It spent four months on the nonfiction bestseller lists in Europe in 2000, and has since been translated into German, Spanish and French. Jacques Pauwels’ book The Myth of the Good War breaks through the propaganda of World War II as portrayed in standard US history books and various Hollywood movies as the United States saving the world. Pauwels uses historical facts and analysis to unmask profiteering by US firms in support of the Nazi war machine. He exposes the humanitarian disaster of the massive bombing of civilian targets in Germany. And he lays out the deliberate delay of the invasion of France by the Allies in order to extend the war in the Eastern Front—thereby exhausting both Germany and Russia and resulting in millions of unnecessary deaths. My political sociology students at Sonoma State University have warmly received these facts and much more for several years. Each year the students would vote the Myth of the Good War as the best book of the semester. I plan to continue to use the new revised edition in my classes and encourage people everywhere to read and understand this important historical work. Knowing the hypocrisies of WWII helps us recognize the lies of the US global empire today.